Should be able to make 500 potions with this clump! Warlords brought about a few big changes to Herbalism in general. Regardless of your skill, you can start picking anywhere. If you have skill 1 you can still pick in Pandaria or Draenor or anywhere in the old world. You’ll simply gather broken plant pieces until your skill is high enough. You’ll get the same skill ups and XP as before, though. And the pieces can be combined, ten at once, into complete herbs. Item stacks are now 200, so professional berry pickers will have a lot more bag space available. All the direct stat benefits of all professions are being removed, so no more Haste or heal bonus. Garrison Herbs have made herbalism easy. If you’re 96+ and have your garrison you should be able to get the herb garden. You can pick herbs with zero skill requirement and no fragments. If you have the skill then you’ll still get the XP and skill-ups. Hand in the seeds for work orders and you’ll get more herbs. Leave the garrison and you’ll need the skill and you’ll start getting those broken plant bits if your skill isn’t high enough. Gold: While there are a lot of the new herbs on the Auction House, from the garrisons mostly, they still sell very well. Old world herbs might have much higher prices, simply because no one is farming them. Alchemy and Inscription, in particular, need those herbs. Check the AH for current prices, especially of the older herbs, and then go pick a few. Tycoon is a big help there. You are leveling alchemy and/or Inscription and don’t want to pay those prices for the non-WoD herbs. . In the Wrath of the Lich King expansion Herbalism become a pretty nice gold making profession, since the herbs were (and are) very much in demand for Inscription. In Cataclysm they became even more valuable, since more glyphs were available and making each glyph required more ink and therefore more herbs. Also, most of the herb farmers moved into the new zones which made lower level herbs a little more rare and so a little more expensive. All profession perks were removed in Warlords, so now more haste or heal from Herbalism. These skill levels apply if you’re not yet in Draenor. Basically, you level up to a point, then see your trainer, then repeat. When you hit Draenor, things change. In Draenor, if you have any skill at all, you will quickly (as you pick herbs) find a scroll that will raise your level cap to 700, even if it’s only at level one. You will no longer need to see your trainer anymore, either. Just pick until you’re at 700. For all of your gathering we highly recommend that you grab the Gatherer Addon. It remembers where you have founds nodes of gathereable materials and remembers the location. Eventually you will have complete maps of those nodes. Note: The value of appropriate skill, these days, is so that you actually get the herbs you’re looking for and not the twigs and stems and petals. Stay in one area and get your skill as high as possible before moving to the next area. If you don’t do that you will find many herbs in the new area that you just won’t have the skill to pick. When you’re in any particular zone set your mini-map to show herbs and do loops around the area. The herbs will show as yellow dots on the map. Once you have your apprentice Herbalism skill go to your favorite starting area and start gathering Peacebloom and Silverleaf. I went to Eversong woods, but these herbs are all over the place in all of the Horde and Alliance starting areas. Once the herbs in your area aren’t giving you any skill improvements you’ll want to go to the next higher zone. I went to the Ghostlands, but the Barrens, Westfall, and Loch Modan are good areas, too. As I mentioned above, if you move on too soon you won’t have the skill to pick anything in the new area. Most of the herbs on this list are the ones you will need for Inscription, so you can level this skill and build your herb stash at the same time. Or sell it all and make quite a bit of gold. The herbs needed for Inscription are divided into tiers. Unlike Alchemy, which requires specific herbs for any given potion, Inscription allows the scribe to use any herb from the appropriate tier. See our Inscription page for the herbs you will want to focus on. Note that skill levels are only necessary if you want the complete herbs, not just pieces. These two herbs are all over all of the starting areas for both sides, Earthroot can be found in the foothills of all the low level areas. Here are some example paths to take, but with Gatherer or Tycoon you can quickly find your own paths. Horde can run a path through Mulgore, it’s easy enough to just make circuits round the base of Thunderbluff grabbing all the Silverleaf and Peacebloom in sight. The same is also true for Durotar, but Mulgore is better. Eversong Woods may be the best of the Horde areas, even better than Mulgore. Alliance will want to hit up either Dolanaar going down south east or so around the lake before heading back to complete the loop. An alternative is just making complete runs of Elwynn Forest or any of the Alliance starting areaa. Undead will want to target Solliden Farmstead first, running north through the mills and looping around back south towards Stillwater and onto Cold Heart Manor + Nightmare Vale and finally back to Solliden for a complete circuit. Earthroot requires 15 skill. Make sure your skill is at least 50 before moving on. Horde will start in the crossroads, heading immediately west and then north right before the entrance to Stonetalon, browse around the Harpies zone a bit before running back east to the Gold Road and south once again to the Crossroads. Alliance can start in northern Westfall, following the coast down south towards Deadmines before turning to run over in the direction of Sentinel Hill, to complete the circuit run back up north again. Another spot is Gol’Bolar Quarry in Dun Morogh, just make full circuits. Alternate areas are: The Ghostlands, Silverpine Forest, Westfall, and and any are for levels 10-20. Briarthorn is pretty common in all the level 20ish areas. Hillsbrad Foothills, Duskwood, and Darkshore are good places to go. In the Northern Barrens you will be running the same path as the above Horde Route, this time however you’ll extend it east to the Sludge Fen and should you so desire it possibly the entirety of the Barrens, allowing you to grab everything you need for this skill level..
Undead will be doing Southern Silverpine Forest, Pyrewood on down to the Hillsbrad Foothills entrance and all the way back for a complete circuit. Alliance can either maintain the same route as previous or expand into doing circuits throughout Twilight Grove located in Duskwood. Another few possible paths are both circuits of Lakeshire – Redridge, Darkshore, and Eastern Loch Modan. You will likely have notices some Bruiseweed in your travels, above. Start scooping it up when you hit 85 skill. Either faction can head up to Northern Stranglethorn to scoop up Bruiseweed. Stranglethorn is one of the more active PvP zones so if you’re on a PvP server you’ve been warned. If you’re high level you’ll find easy kills here, along with your herbs. Besides the possibility of gankage, Stranglethorn has a lot of herbs covering several levels. You will be able to stay here and get a lot of herb leveling done. Horde can start at the Ashenvale Ramparts and head north-east towards Splintertree Post, make sure to run a wild path rather than follow distinct roads and such, alot of the herbs are out there in the forest and not so easily located as before. Once you hit Splintertree head west towards the bridge and south around the moonwell, turn here for the final part down to the Ramparts and you’ve completed a circuit. The Stonetalon Mountains are viable, hit up Camp Aparaje, head west from there towards Grimtotem Post, south to Malaka’jin, and finally east to the Greatwood Vale before returning to home point. Another path is The Field of Giants, southern barrens inbetween the razorfen dungeons. Windshear Crag contains various herbs should you desire to go there as well. Alliance can go North of Mystral Lake or West of Astranaar for various herbs in Ashenvale. Other spots are making circuits around the Stonewatch Keep in Redridge Mountains and the Eastern Coast of Loch Modan for dwarves. Northern Stranglethorn, again, is a good place for Steelbloom. Stay to the norther half of the zone and make circuits through the hilly areas. Horde can head for Stonetalon Peak once more and run circuits along the roads, looking to the hilly areas. Alliance & Horde can both try out Arathi Highlands (circle the zone, along the hills) should they wish to, it has a generally more active PvP population than previous zones however, additonally Stranglethorn Vale is very similar and you can hit up the various troll ruins and other such areas around there for herbs. Desolace is another viable zone for Alliance or Horde, it’s rather large but contains a generally high amount of herb spots for those willing to travel more off-road than on. Still in Northern Stranglethorn, but this time stick to the flatlands for Kingsblood. Western Plaguelands, Wetlands, and the Southern Barrens are other good options. If you were in Desolace for Wild Steelbloom then just move to the flats for the Kingsblood. Goldthorn likes the hills and Fadeleaf tends to be hidden with other vegetation. Liferoot can be found along the edges of pool, streams, etc. If you are in Stanglethorn then drop down to the Cape of Stranglethorn. Fadeleaf can be found all over the place and some Goldthorn is in the hills. Feralas has plenty of Fadeleaf, keep to the valleys and lowlands. Arathi Highlands is a decent place for both herbs and is also good for the next one, Khadgar’s whisker. Cape of Stranglethorn is a good place to go for Khadgar’s, or to stay if you’re already there. Western Plaguelands and on into Eastern Plaguelands should get you enough Khadgar’s Whisker to easily get you into the next tier. Try to get your skill to at least 205 before leaving, then you can skip the Badlands & Dragon’s teeth. This herb replaces the old Wintersbite. It’s In the Badlands, all around Scar of the Worldbreaker. This is pretty much the only place to find this herb. Firebool is found in the desert areas: Burning Steppes, Tanaris, Searing Gorge, and the Badlands. Do full circuits of any of these areas, keeping to the flat areas. Tanris is big enough that you might want to divide it into section and work one section at a time. .
Eastern Plaguelands (EP) is the place to be for Sungrass, but Thousand Needles (TN) is good, too. It’s all over the place in EP, in the grassy areas and very low hills. In TN you will have to scan the cliffs around the zone, you won’t find any in the water. You can also find the stuff in Badlands, Burning Steppes, Silithus, Searing Gorge, Tanaris, and Un’Goro Crater. At 235 you will also be able to pick up the occasional Blindweed that you find. Gromsblood is all over Felwood, and that place is by far the best place to collect this herb. Run full circles/circuits of Felwood Other possibilities are Mannoroc Coven in Desolace for Gromsblood and the area around the Dark Portal in the Blasted Lands. At 260 you can start picking up Golden Samsan. Now we start running both Un’Goro and Silithus. If you went to the Blasted Lands for Gromsblood you should be able to find plenty of Dreamfoil in that zone. Keep collecting Dreamfoil. At 280 you’ll be able to gather Mountain Silversage. Once you hit 300 you can either head off to the Outlands or keep gathering in the Blasted Lands. Once uptn a time you had to hit the Outlands for your Master Herbalist training, but now you can get it from any trainer anywhere. Then you can either run off to Outland and gather up all the Felweed that you can find or continue in Felwood, farming the heck out of it for more Dreamfoil and Mountain Silversage. Generally I’ll run circuits around the corner areas before slowly circling in towards the center, reverse this process to complete the circuit, also should you run into a bit of opposition kill it or try going up north into the Blades Edge Mountains, or south to Terrokar Forest and check those out as well. Once you skill is 350 then you can head off to Northrend. Once your skill hits 400 you can pick Tiger Lily around the edges of lakes and streams. With half an effort your skill will be 450 before you hit the higher level areas for Talandra’s Rose, Frozen Herbs, Icethorn, Lichbloom, etc. Ok, now you know the drill. Gather up everything you can, then move on. You can start in either Mt. Hyjal of in Vash’jir. Hyjal is a great place for Cinderbloom, while Vash’jir has Azshara’s Veil. Both of these starting Cata herbs will get you well into this tier of your progression. When you hit 475 skill you can head to Deepholm and look for Heartblossom. It’s available pretty much all over the place. Whiptail, at 500, can be found in Uldum (and Tol Barad, if you like some excitement with your flower picking.) Pick it until you hit 525. 525-600: As before, start in the lowest level zone Valley of Four Winds and work your way up. Green Tea Leaf is the most common of the M of P herbs. You will find it all over the place in open and forested areas. Rain Poppy common to the lower level areas, always near water, just like Liferoot. Snow Lily is only on the very cold areas. Fool’s Cap is in the higher level zones only. Golden Lotus – This is a rare drop as you collect other herbs. Note that at some points during your flower plucking you will attacked by some sort of podling, whether in the world or at your garrison. These drop complete herbs when slain and are pretty easy to kill. Frostweed – found in the chilly places. Earthroot same, look to the hilly areas. In the scar and only there. Purple Lotus Felwood, around ruins. Green Tea Leaf All 85+ M of P zones, most common M of P herb. Forest and open areas. 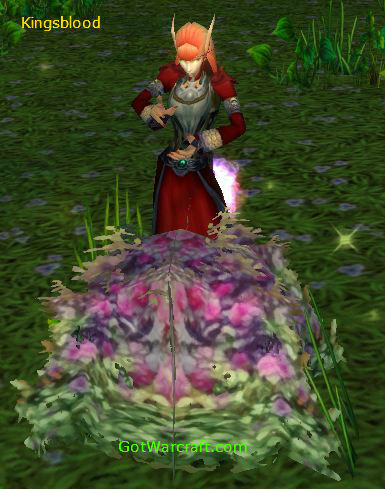 Golden Lotus Rare, find as you collect other herbs. All over, but rare.